Greetings from Railton, Tasmania. Topiary Capital of the Southern Hemisphere. But let’s continue on with our journey through prime mountains. Begin by mounting Sheffield’s finest viewing platform. As far as I can tell this range is called the Mt Roland Regional Conservation Reserve. But Mt Roland is the highest peak with Mt Van Dyke the second highest. Coming from the east, as visitors do, it’s the beginning of the Western Tiers. I drove past it years ago and it took my breath away. The dolerite crags just seem to soar impenetrably. Route: There is a track up the face which has been closed because of its danger. There is also a ridge walk from one end to the other which would probably take several days. The standard track is 4 km along a firetrack which actually climbs quite a bit, a very steep but relatively short climb up a creek gully (400m up in just over kilometre), 3 km across a button grass plateau and a nice little bit of bouldering at the end. Height gain of 600m. and about 16 km there and back. On a good day like we had it is quite an easy walk — medium more correctly, it does have the climb up the creek gully. 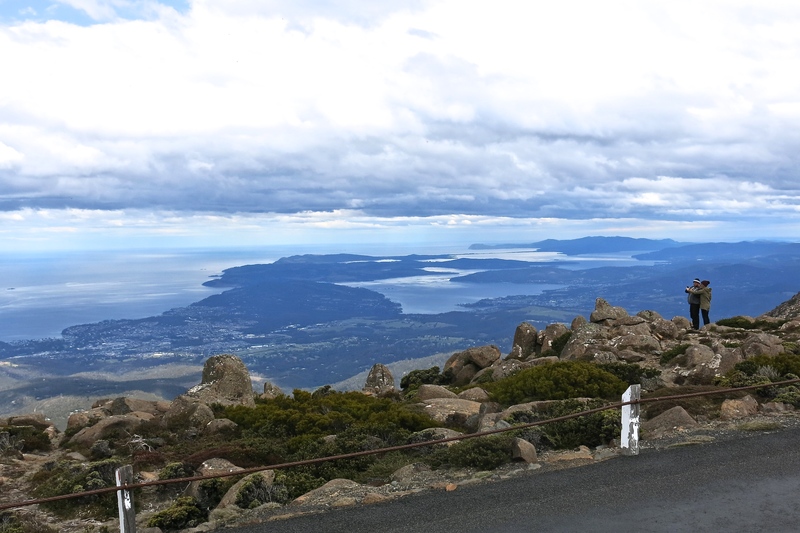 But we’ve tried five times and failed twice, mostly because of weather — it’s Tassie after all — although one time a late start didn’t help. Just to be clear, this is where you are headed. The looming presence is intermittent, but tangible and enough to leave you dangling. How on earth are you ever going to get up there? 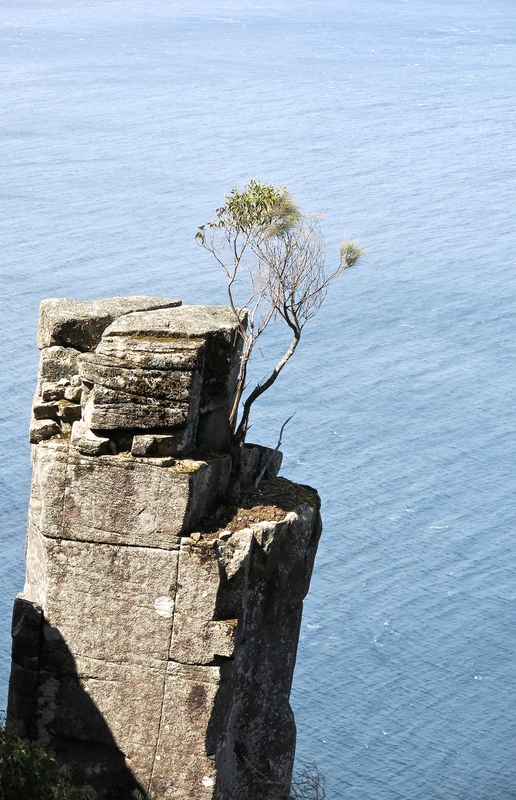 Mt Roland is not isolated. It’s only 15 km from Sheffield (with great murals, Mural Capital of the etc. ), and the plains surrounding it are littered with holiday houses and farms wanting to make the most of the formidable view. You start from O’Neill’s Rd. This road quickly shifts into a rough four-wheel drive track gaining height quite steadily as it sidles up across the foothills of the cliffs. 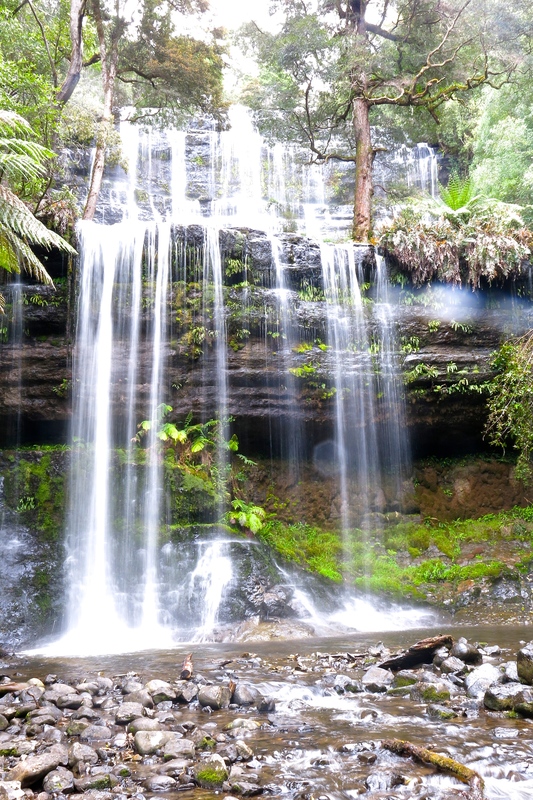 It runs through a glorious wet, eucalyptus forest with massive stands of tree ferns. After half an hour there are stands of curly-branched John Glover gums the name of which I don’t know. I used to look at his paintings and think he had a visual infirmity when it came to trees. 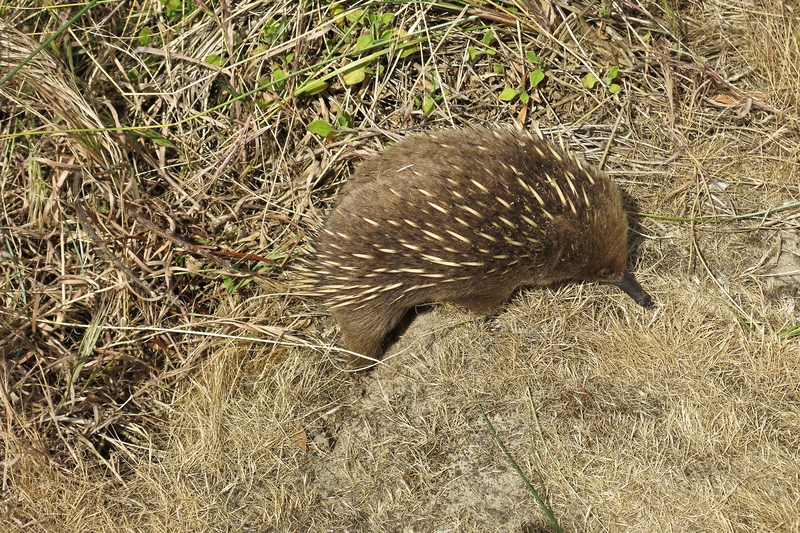 But then I started looking and found them all over the island. This section is completed when you come to a log bridge spanning a gully with steps formed on the other side. Lots of steps. You’re going up a crack that is not the one in the picture below (another section of the Mt Roland range) but which is very like that one. In or after wet weather, of which there is plenty here, the track is both muddy and slippery and in places a water course. We’ve moved into nothofagus country which means lots of mosses, lichens and exotic tortured shapes, Lord of the Rings country. It was neither wet nor muddy on this lovely day and we duly popped out at the rest point at Reggie’s Falls with certain of us raring to go after cup of tea. You walk almost straight out onto the plateau with its wonderful views, button grass and expanses of flowering alpine heaths, bushes and orchids. There is a kilometre or so of duckboard to get you across what can be wetlands. Fake Mt Roland (above) is to your left. It looks a lot like you’re walking over to the high point but actually that’s only a precursor. 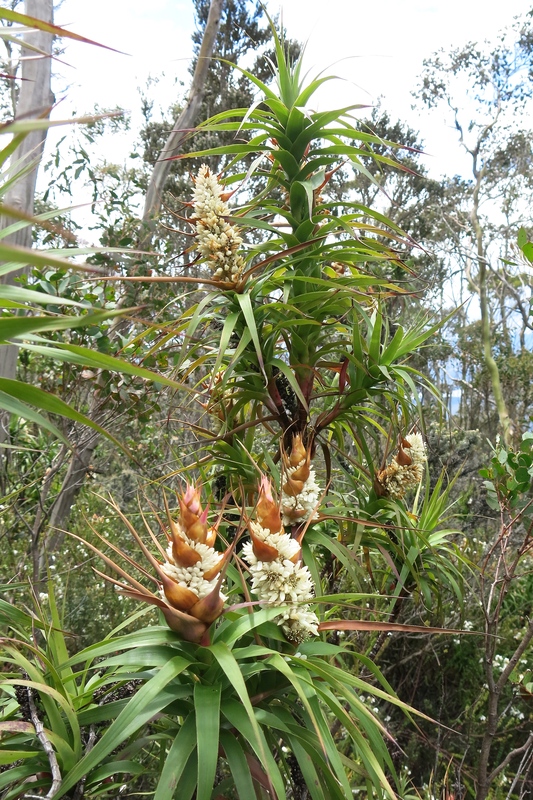 There is still another 40 or so minutes to get to the peak with dead but still lovely scorparia flowers on the way. I don’t want to go on about this but that rocky track is a water course in the wet. It can look like the ‘track’ at the left which is actually near Tongariro in New Zealand. But not today. No impediments today. Simply a perfect day for walking. You go up this gully visible between the two rock outcrops in the photo above, climb left, and you’re there. And on a day like this, ‘there’ is quite something. Look at that for a mountain! The peak is the lump to the right. The Naturalist, another peak only 5m lower is to the left of that on top of a crowd of ‘organ pipes’, columns of dolerite, a very hard igneous rock which when weathered collapses into boulders. 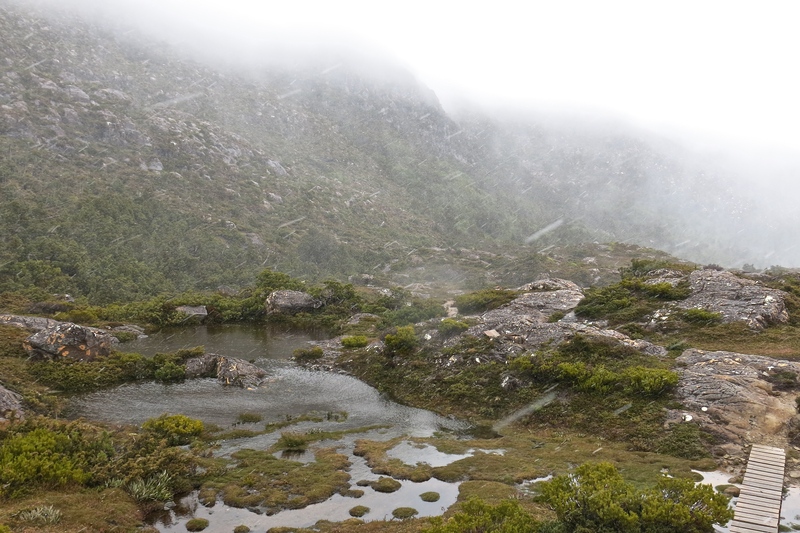 Dolerite columns and boulder fields are found almost everywhere in Tasmania. Climbing Mt Field is not the issue. Getting there is. Route: There is only one ‘direct’ route to Mt Field. But I may never get to the peak again so we thought for the sake of completeness we’d include a major deviation. Urquhart’s Track up from the Lake Dobson car park, Snowgum Track across to Rodway Hut. That’s all normal. But then out across Tarn Shelf, up over Newdegate Pass and back to K Col intersection. From there resume the normal route out up the spur and across the pincushion plateau. Back the most direct way through Lion’s Den. The Lake Dobson carpark is at 1000m. But you have to climb over the Rodway Range before you can start the ascent of Mt Field again, so up to 1300m over boulders, down 200m, up 450m. About 25 difficult km. A big day. We began very early for us. We were walking around Lake Dobson at 7.00 and got up the gravel road to the ski huts quite smartly. Someone, possibly the skiers, has built a kilometre or so of duckboard across a shelf going in the right direction which is always most welcome. We were at Rodway Hut (below on the left) before 8.00. With magnificent views of Lake Seal a few hundred metres below and Tarn Shelf crisp in a very clear morning, that could have been satisfying enough. Tarn Shelf is a destination in itself. 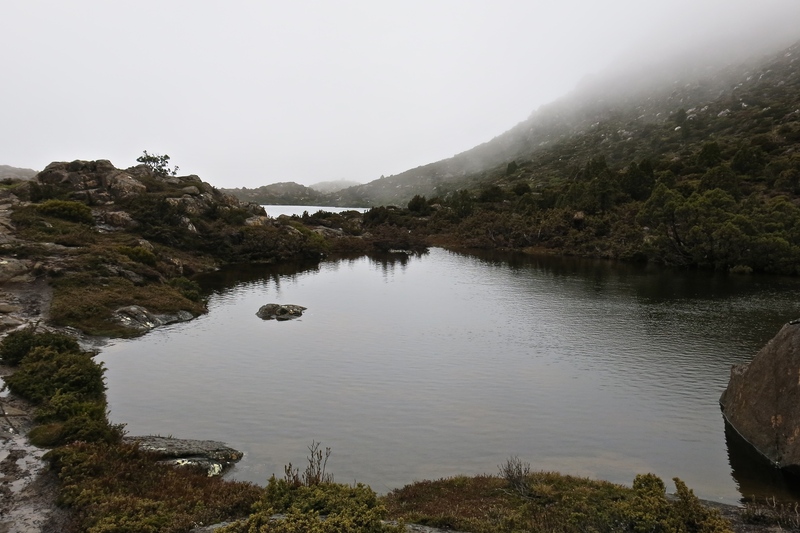 Eight tarns (alpine lakes, often glacial) big enough to go on a medium-scale map, a dozen or so smaller, so as you walk through them you have all these water effects and reflected light as well as the remarkable alpine vegetation — including pencil pines and some pandanus — squeezing itself in between the rocks. Further along there are stands of dead pencil pines dramatically weathered. We got to Newdegate Hut at the end of the Shelf by 9.30 and set off over the Pass after cup of tea. The views from the top of the Pass were consistently grand this day. Unusually, long perspectives were possible. Duckboarding takes you across the very top of the Pass through the pincushion and water pools. Mt Field is sitting over in the distance with its top in cloud which remained there for most of the day. We got this clear view of the bird’s head of Mt Field and The Naturalist as we skirted back along the Rodways. And this is what you’re looking for. It never seems to come. Newdegate Pass is visible just to the right of the outcrop, The Watcher. Not apparently far, but it’s a mushy, rocky track with two or three boulder fields and plenty to trip on. Turn right (left in the photo) with gratitude. Time for lunch. Except we did another hour. 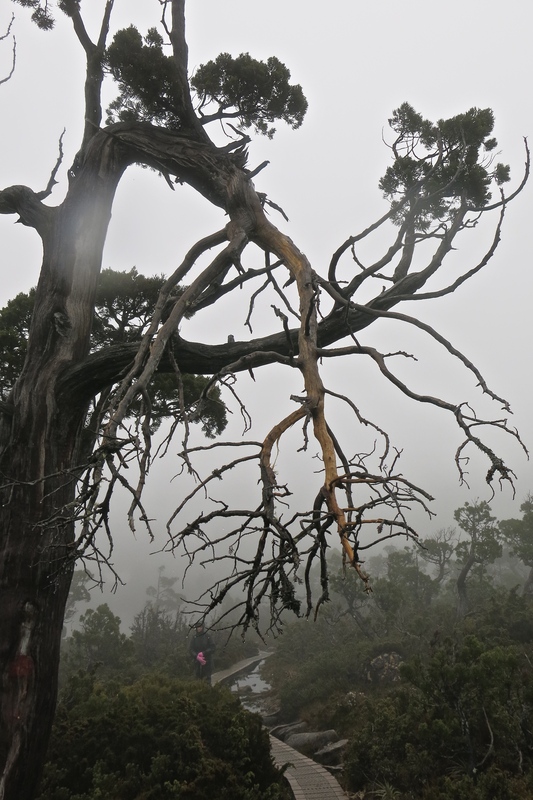 Through the mist on the plateau … That’s from the top — a currawong welcoming us. We turned around and had been walking for ten minutes when it all cleared. That’s the peak of Mt Field West. And this is The Naturalist which we thought we would also climb. In the far centre distance of that photo above you can see a boulder field which stands between us and getting home (about half way actually). This one. We got to the top of that, there was an elegant little alpine garden, and then an hour or more getting through the Lion’s Den, a valley of boulders which asks for huge steps, jumping and hand climbing — quite a lot for that time of the day. There are no photos because no one seems to take photos of the Lion’s Den. They’re too busy just trying to get through it. Not for the faint of heart. I think I had just gone into a slightly dismayed version of automatic. We got back to the car at 7.30 scarcely able to move. It had been overly ambitious. I admit it. Freely. A week has passed. This time next week I’ll be lying in hospital with a canula or two plugged in my arm dazed and confused with a big bandage on my left knee. And? Je ne regrette rien. These are photos of a precious adventure. Headline! Freak out! 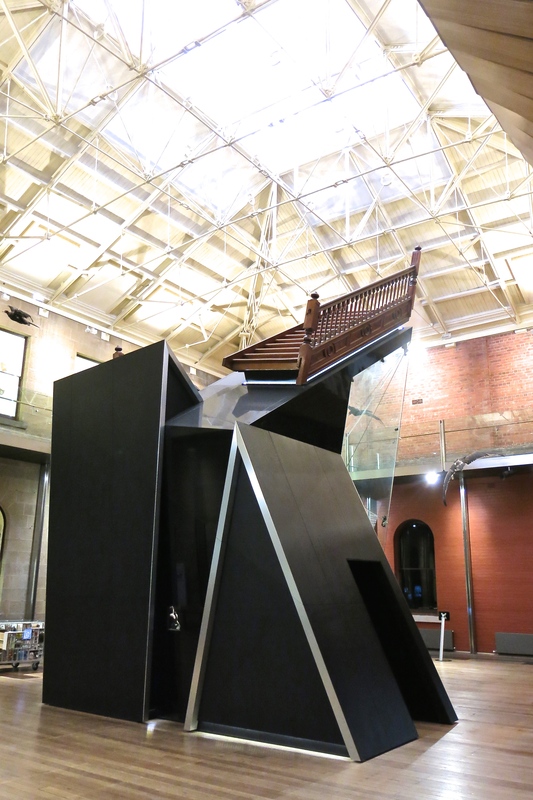 I have previously expressed my confidence in and delight with Tasmania’s Museum of Old and New Art. But on our recent trip to Tasmania we went to MONA again and the unthinkable occurred. David Walsh seemed to have lost his touch. We went. The bottom floor was closed in toto but the upper two floors were still mesmerising. Yves Netzhammer’s giant installation and the welcome return of Nolan’s ‘Snake’ were among the highlights. I also discovered who is singing flat in the Madonna exhibit, and decided it wouldn’t be the same without him. During a discussion about tickets we got invited back the next night to the opening of the new monster blockbuster — ‘River of Fundament’. The work of the ‘greatest artist in the world today’, or ‘one of the most important artists of our time’ (Nicole Durling from MONA, whose taste I have previously described as impeccable). (Did the ‘possibly’ escape me? I might be being unfair.) 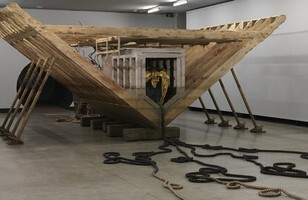 Matthew Barney!!! Munich. Beijing. Hobart. 143 crates of material, one casting weighing more than 6 tonnes. Forget Ben Hur. Bigger than just about anything. And an opening … wooo hooo. Watching le tout Hobart done up and out and about was worth far more than the price of admission. Special mention to the glittering onesie shorts set. Jack was there (Thompson) and Brian and Rach (Brown and Ward. Come on.) among other luminaries. I don’t know whether that was a bad sign or not. Probably. In the last Monthly David Walsh is quoted as saying, now he just rings up Steven Pinker and says have you got some neurophysiology stuff? And his book’s out. He might have tipped over and gone a bit spack. Or he might just be enjoying the perversity of it all. ‘River of Fundament’ has been growing for decades, longer, from a request by Norman Mailer to turn his worst book ‘Ancient Evenings” into an opera. It is an opera. It is also film described by an art gallery staffer who went to see it as a 6.5 hour marathon (and yes it is) of ‘an artist’s aggressive hatred for his viewing audience.’ That might please David. It would certainly pique his fancy. We didn’t see the film which might provide some sort of entrance to what there was on display in the bowels of Berriedale Point. 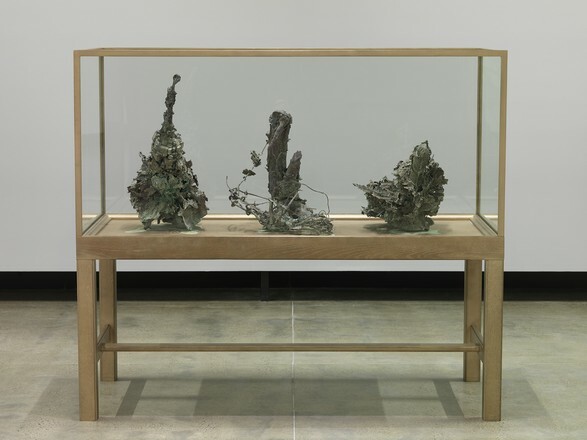 ‘The physical and iconographic origins of this powerful, immensely heavy (I think The Mercury, VOICE OF TASMANIA, said six plus tonnes) and more than car-sized form, completed just this year, lie in Barney’s great sculpture Djed which was cast on site in Detroit during the live Khu performance in 2010 (now seen in Act II of River of Fundament). 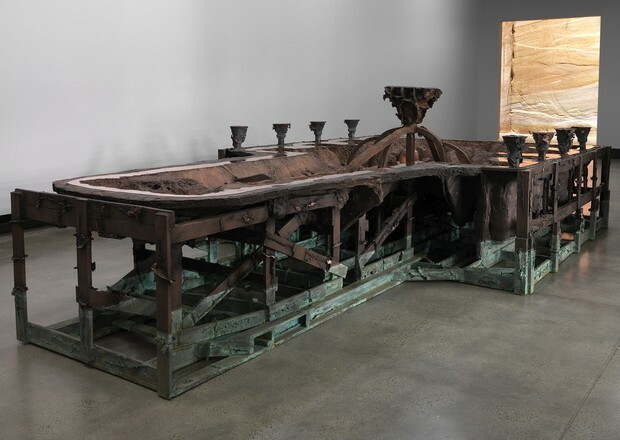 Both Djed (too large to be brought to Tasmania) and the present work, Rouge Battery, are part re-embodiments of the Chrysler Crown Imperial that was beaten and ritually torn to pieces in Act I.
and sometimes big (although I quite liked this one. It’s Norman Mailer’s attic where he writes/wrote, upside down. Yeah I know, I know. Obvious.) But really … Excrement, putrifying matter, fighting or copulating bodies, all glisten with moisture. Sulfur is dissolved in urine. Organ pipes bubble. Molten metal flows. Mercury runs across a bathroom floor or falls from the cavities in a murdered car engine. 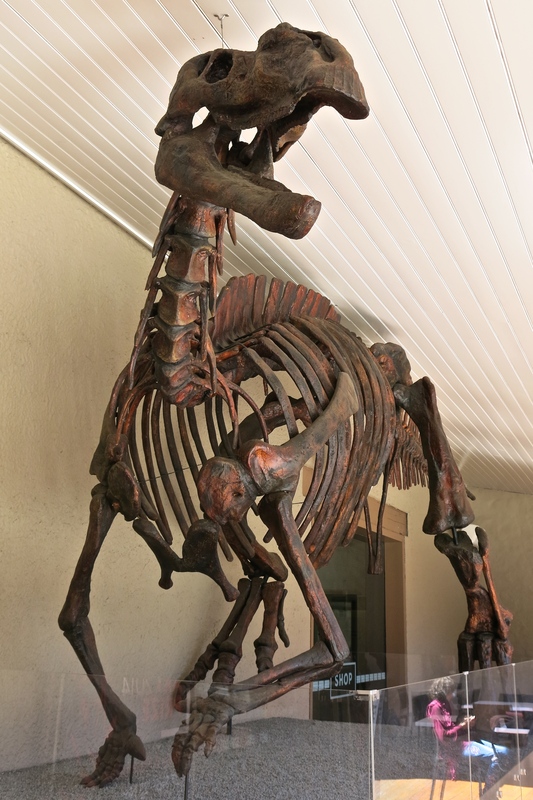 Buffalo blood pours through the attic floor and down Mailer’s apartment walls when Norman III finally dies there. In the exhibition, the phallus forms in Coming Forth by Day [first pic above] seem to ooze into the base of their vitrine; something has drained out of Crown Imperial’s polycaprolactone tomb. The after effects of electrical actions, set solid in sculpture, seem still almost alchemically charged with metamorphic potential. And this great Boat of Ra is cast adrift here with its bronze mooring ropes, almost as far from either Egypt or New York as it is possible to be. Mmmm obvious. You’ve now seen the highlights. It’s a mash-up of the end of the Detroit car industry, Mailer’s life and book, Ancient Egyptian mythology and the detritus of Barney’s mind. It was never going to be very engaging but without the 6.5 hour experience I’m afraid it’s nothing, just puzzlingly dull and trivial. And we were left wondering if David had been seduced and violated by celebrity, one of the oldest and saddest stories of all. Or even, horror of horrors, whether he just might be bored. But let’s be clear. Emphatic. This Emperor has no clothes. And now there’s whole floor of space that needs filling with good stuff. Like before. So let’s turn to quality. TMAG. 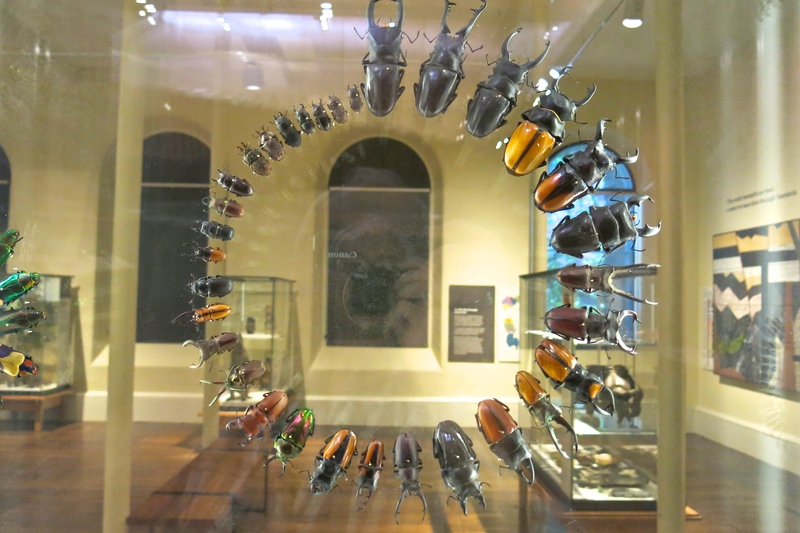 Tasmanian Museum and Art Gallery. It’s been done up, completely re-thought, and it’s terrific. I loved it. After a few hours you leave it with a very powerful sense of where you are, what it’s about and how it’s been with a very fine art experience thrown in for good measure. Upstairs is one of the two extant versions of Benjamin Duterreau’s ‘The Conciliation’ — George Augustus Robinson rounding up what he thought were the last of the Palawa Tasmanians and doing good by carting them off to Wybalenna on Flinders Island in Bass Strait where almost all of them died. 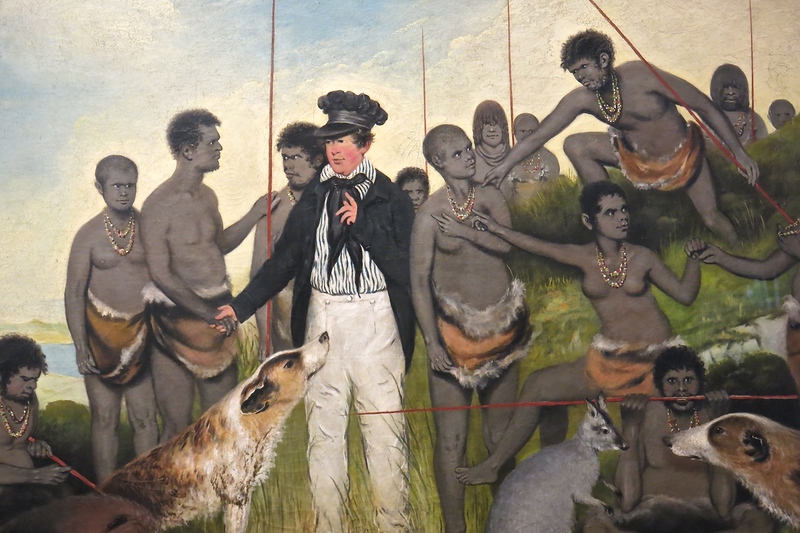 There is so much that could be said about this: the unintended irony of the title, the dog and the pademelon trading glances, the European obsession with the Palawa method of spear-straightening, the record of shell necklaces. And Robinson with his florid cheeks. A joke figure? It’s hard to read otherwise. 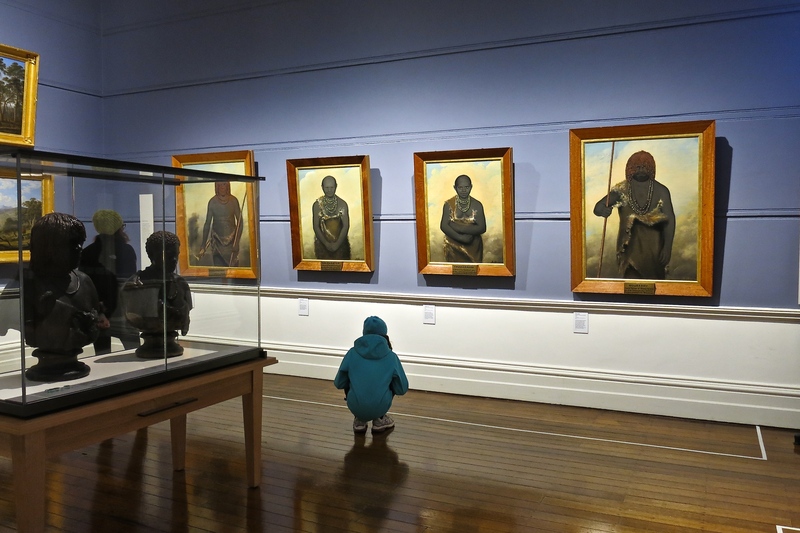 But what gets me most is that, just like the other version in Canberra’s National Gallery, the paint is cracked and beginning to peel, mostly from the distinctive grey skin of the Palawa. They’re disappearing in front of our eyes. How appropriate. and the scoparia was out. 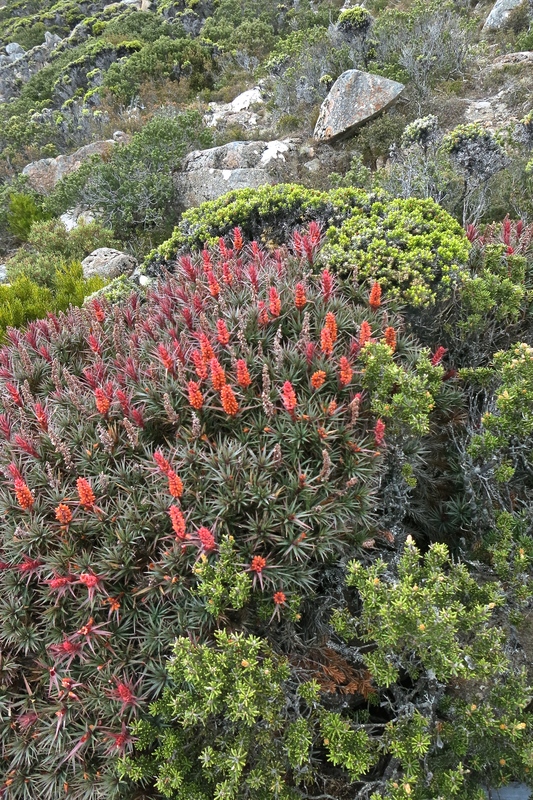 Below the very top it was a blaze of floral colour. 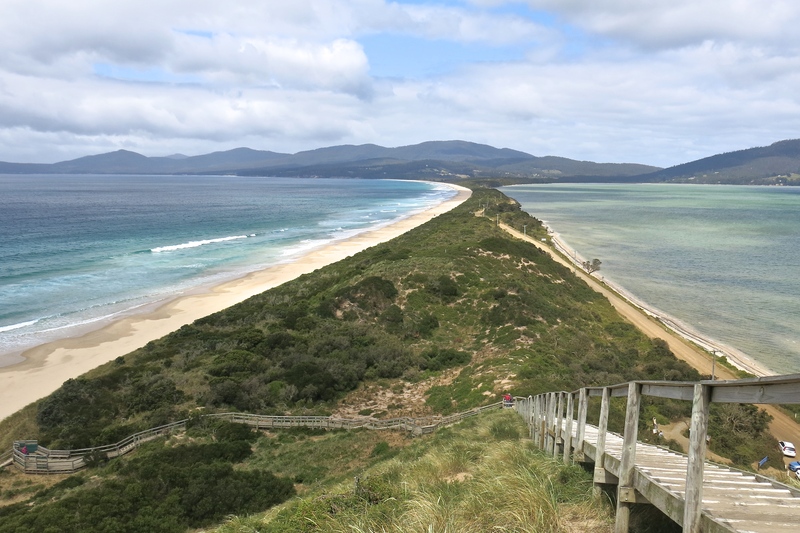 We spent some time on Bruny Island, visible off the coast above. I like the complementary lines in the pic. below of the Neck. So much beauty everywhere. National Park. Russell Falls falling. We were there to climb Mt Field West, a very rocky traverse of the Rodway Range before the Mt Field plateau. We were going the long way via Tarn Shelf for reasons of scenery. But when we got up the top, it turned out to be for reasons of self-preservation. The wind was strong enough to blow me off the duckboards. The horizontal sleet would come from one direction and then suddenly shift to the opposite. It snowed. This is an effort to take photo of snowing. Rarely have we encountered so many varied types of precipitation (mostly violent) in so short a time. And this is how it looked at brief moments. Glorious. But, we were rebuffed. The track up the Newdegate Pass was a river, the wind noise from the tops sounded like a steam train driven by dervishes, and I’d lost the feeling in my fingers. We turned back. What a place. 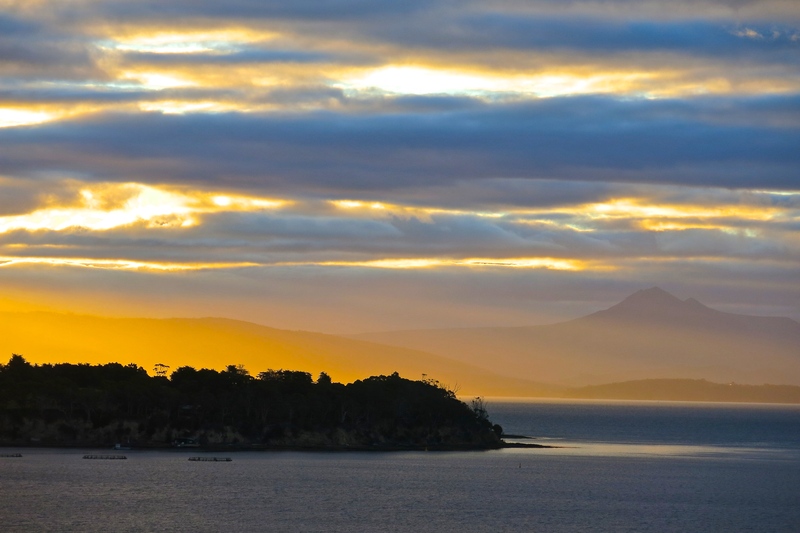 The new header pic is the view across the D’Entrecasteaux Channel out our Bruny Island shack window with Hartz Peak in the background.